Darchei Yesharim – passages added by Chassidim to the prayers of Shabbat eve, with a commentary to Psalm 107 (Hodu), by R. Yisrael Baal Shem Tov; Hanhagot Yesharot from the Baal Shem Tov, and his disciples R. Menachem Mendel of Premishlan and R. Dov Ber – the Maggid of Mezeritch, with glosses by R. Avraham Abele of Chidnov (Chudniv), posek and maggid in Vitkov (Novyi Vytkiv); the Mora Mikdash booklet, regarding the severity of the prohibition of idle talk in synagogues, by R. Yaakov Yosef of Ostroh (Rav Yeibi). [Zhovkva? 1794?]. First edition. The kavanot of the Baal Shem Tov for ritual immersion, with a commentary by the Maggid of Mezeritch, are printed at the beginning of the book. These are followed by the additions which Chassidic communities insert in the Shabbat eve prayers: Patach Eliyahu, Yedid Nefesh, Hodu, K'Gavna – with the addition "V'Lomar Barchu" for one praying the Shabbat Arvit prayers alone, without a quorum. Alongside the text of Hodu (Psalm 107), the kabbalistic commentary of R. Yisrael Baal Shem Tov appears. The second part of the book contains Hanhagot Yesharot from the founders of Chassidism - the Baal Shem Tov, R. Menachem Mendel of Premishlan and the Maggid of Mezeritch, with glosses by R. Avraham Abele of Chidnov, posek and maggid in Vitkov. At the end of the book, the Mora Mikdash booklet is printed (third edition), regarding the severity of the prohibition of idle talk in synagogues, by R. Yaakov Yosef of Ostroh (Rav Yeibi). This book brings together in print, for the first time, all the passages which Chassidim add to the prayers of Shabbat eve. This is also the first time that the addition to be recited after K'Gavna when praying alone, was printed: "An individual concludes after Binehiru DeAnpin: V'Lomar Barchu…". The background of the book: In the 1780s-1800s - years of the propagation of the Chassidic movement, several siddurim of the Arizal with Nusach Sefard prayers, were printed for the first time in Eastern Europe. In some of those siddurim, prayers which Chassidim added to the Shabbat eve services were included, yet since the opposition to Chassidism was then at its peak, no siddur yet contained all the additions, which were gradually introduced. 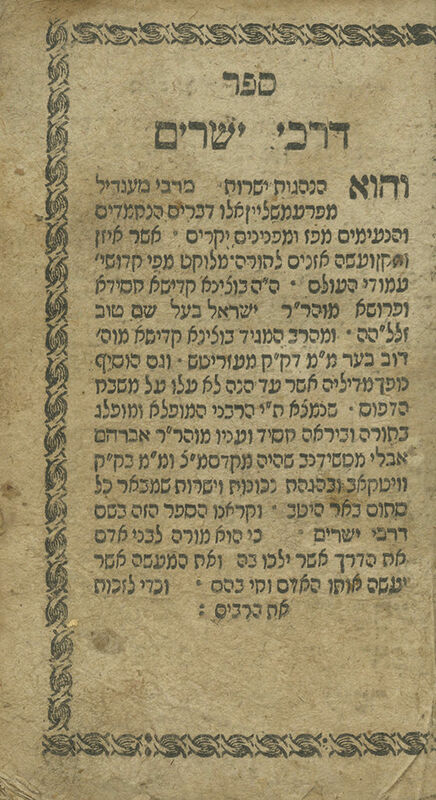 In 1788, the text of K'Gavna was printed for the first time in the siddur of R. Asher, before the Arvit prayer of Shabbat (in place of Bameh Madlikin), though without the other additions. In 1794, the approximate printing year of this book, the siddur of R. Shabtai of Rașcov was printed. The printers did not dare to insert the Chassidic additions to the Shabbat eve prayers in the body of the siddur, but a leaf containing the text of Hodu and K'Gavna was added to some copies. In this book however, all the additions were brought together for the first time in print: Hodu, Patach Eliyahu, Yedid Nefesh, K'Gavna, as well as the addition for one praying Arvit without a quorum "V'Lomar Barchu". In the early 1800s, these additions were all printed in the siddur of the Baal HaTanya and in the Kol Yaakov siddur (apart from the addition "V'Lomar Barchu", which was not printed in the Kol Yaakov siddur). The custom of reciting Hodu before Mincha on Friday is one of the innovations of the Baal Shem Tov (Meor Einayim, Beshalach; Shem Aharon, Warsaw 1910, p. 12a). Rebbe Shalom of Koidanov, the Mishmeret HaShalom, wrote regarding the commentary of the Baal Shem Tov on Hodu: "Behold it is known that our holy teacher, light of Israel, the Baal Shem Tov, instated to recite Psalm 107 every Friday afternoon before Mincha, and he composed a commentary through Divine Inspiration, and who can grasp its secret" (Shem Aharon, ibid). leaves. 13.5 cm. Fair condition. Stains, dampstains and wear. Marginal tears to several leaves. Lower margins of leaves [20-21] trimmed, affecting one line of text. Place and year of printing established according to: A.M. Habermann, 'Sefer Tzavaat HaBesht and the Other Early Anthologies of the Teachings of the Baal Shem Tov', Sefer HaBesht, Jerusalem 1960, p. 46. Rare. Stefansky Chassidut, no. 143. • Bound before it: Darchei Tzedek, practices based on Chassidic teachings, by R. Zecharia Mendel of Yareslov (Jarosław), disciple of R. Menachem Mendel of Lizhensk. [Lviv, 1796]. Fist edition. leaves. Lacking first 13 leaves. Stains. Wear and large tears, affecting text. Margins trimmed, with damage to text. • Bound after it: Orchot Chaim, laws and ethics, by Rabbenu Asher (the Rosh), translated to Yiddish. Metz, . 10 leaves. Lacking last 26 leaves. Stains and wear. Three books bound together. Without binding.